Welcome to part three of a series where I’m sharing my own perspective on a few TV shows out there in TV wasteland. 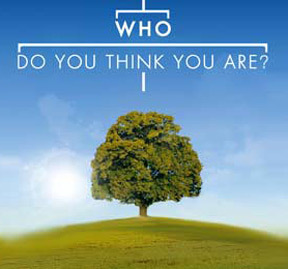 This time I’m featuring: WHO DO YOU THINK YOU ARE? If you are not familiar with this show then you don’t have all the useless channels I have on cable. Instead of watching the riveting Golf channel or seven choices of Public Access Television, I somehow caught this show and then got sucked in for the whole series. The premise of the show is to take celebrities and follow their genealogy roots back in time through their family history. Genealogy is huge these days. Everybody wants to know about where they came from. Now granted, watching a show on somebody else’s genealogy pursuit sounds a bit like watching a video of my tax accountant doing my income taxes at his desk but in reality, they made it fairly interesting. - Mathew Broderick’s show took him back to one of his great, great grandfathers who died in the Civil War while fighting in Atlanta. He’d survived the Battle at Gettysburg only to have died of “a cannon ball through the head” during the next big battle. It’s a funny thing about cannon ball through the head injuries…you don’t have that same feeling of “will they live?” you get with a normal gunshot incidence. But the most ridiculous of all the stories was Brook Shield’s genealogy. Her roots took her to lavish Italian Villas of kings and nobility. But it didn’t stop there. No, she descended from France and they took her family tree back through famous kings and nobility where one of her descendents was born in the Louvre in Paris. That’s right, the Louvre! It wasn’t always a gallery…apparently it was a home at one time. Just your modest summer home. But it didn’t stop there. She also descended from King Louis the 14th; one of the most powerful Kings of all time. But it didn’t stop there. She descended from King Louis, who also a saint as well as the king that started all the kings. In all, they traced back to about 1000ad. Sheesh! What are they going to do to top that next year? Expert: Bob, we’ve traced your roots back to Adam and Eve. I know where I came from and that's all that matters. My mom swallowed a black watermelon seed and sometime later I was born. If you're wondering why I'm childless, it's simple: I've never eaten a black watermelon seed. I was warned about this as a child. Do you suppose god can really communicate with Bob? I can't understand a word he says anymore. We've had "Who Do You Think" over here for a few years now and I know that the episodes van vary depending on the person who they are focusing on. But there has been some fascinating stories and such histories of "ordinary" people always seems to be more gripping than many of the fictionalised historical pot-boilers. Hmmmm... Sounds like This Is Your Life played in Mr. Peabody's Wayback Machine. Holy crap. My ancestors just come from farmland in Russia. BORing. No wonder why I'm not a celebrity! Wow, that sounds like a show I'd enjoy watching! I've always wondered if I'm related to anyone famous! The Scribner family? Uh, move along - nothing to see here, folks. I might have had a poster of Brooke in her Calvin Clines, though. I don't have this useless channel I guess. Great take on the Bob Dylan~LMAO! But this only goes further to prove that there's nothing good on th' telly, wot? I have Native American ancestry (Potawatomi), plus one of my relatives was a pirate back in the 1700's, PLUS I'm related to Benjamin Franklin. Pirates, Indians, and Benjamin Franklin. Is it any wonder I became a geek who loves water, nature, and science? I am an ailen and so it is very hard to trace my ancestry. Although I think they did launch the Hubbel to take pictures of all the different places that my family visited on their way here. Or maybe that was just in my mind, wow I am so Lost now and life is so confusing. What am I gonna do if I don't know where I come from or where I am gonna go. Help, please help find me. Spike Lee having a red neck relative....there is a God. Sharonheg – See…if you had better ancestors you’d be famous now! Roy – I suspected you did…. i hate a lot of tv shows... this one is near the top of my list. Silly celebrities... thinking that they're descended from royalty. Don't they know that the stork brought all of them? You watch too many reality shows.